General Information: The Klondike Royale™ has an appearance unlike anything else in the marketplace. They are a round variety with light to medium golden skin accented with distinct purple crescent markings around the eyes. The flesh of our Klondike Royale™ is creamy gold colored and has naturally smooth and buttery texture when baked, roasted or mashed. Grilling the Klondike Royale™ gives them a crispy skin that enhances their buttery texture and creates a slightly sweet caramelized flavor. Klondike Royale™ are ideal for making crisp, golden french-fries with a satisfying earthy flavor. The bold appearance of Klondike Royale™ accents a variety of entrees and its gourmet flavor profile effortlessly transforms ordinary potato recipes into a taste sensation. 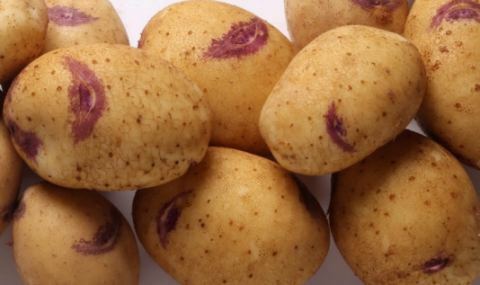 This unique variety is coming to market just in time for Potato Lover's Month and will be available for about 10-12 weeks.